Giovanni Palestrina’s masses represent the zenith of Counter-Reformation Italy. Palestrina borrowed the melodic material for this mass from a motet by a Spanish contemporary, Cristóbal de Morales. The mass itself is set in five parts, SATTB, matching brass quintet voices, in the gentle polyphonic style for which Palestrina is revered. 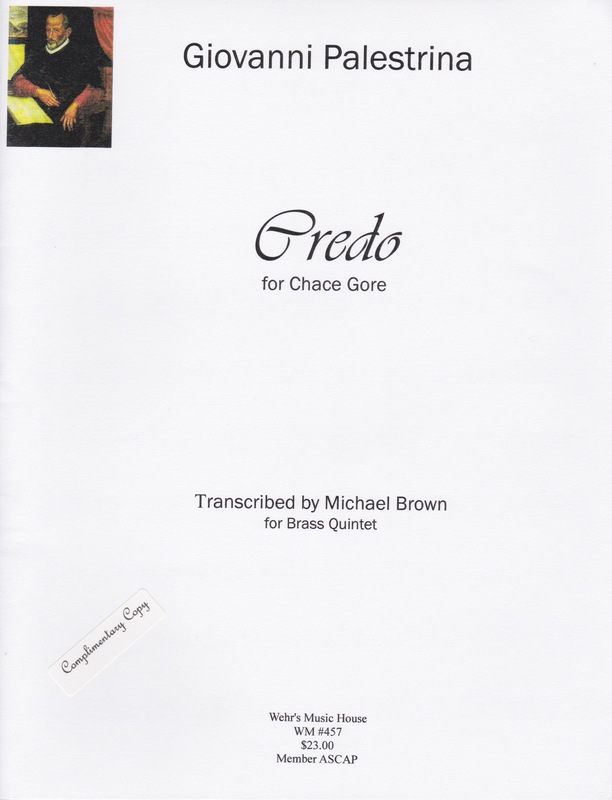 Michael Brown has set three of the movements for brass quintet: Credo, Sanctus, and Agnus Dei I, each published separately. Brown’s transcriptions are straight-forward, faithful renderings of the original choral setting. The tuba part is often set an octave lower than the bass choral part but the other quintet parts are in the original registers of the vocal parts. Thankfully he simplifies the meters from the 1880’s Breitkopf & Härtel edition of the work. The Sanctus is presented in three sections corresponding to natural divisions in the text. The opening Sanctus features sustained pitches in the treble voices soaring above the active motion of the lower voices. The second section, corresponding to the text Pleni sunt cæli et terra Gloria (the heaven and earth are full of Thy glory) begins with strict imitation one measure apart that features only the lower four parts. The closing section, corresponding to the text Hosanna in excelsis (Hosanna in the highest), is a joyous outburst of even more intricate counterpoint. The brass parts are not difficult—most parts stay within the staff, although the trombone part has a somewhat higher tessitura than the others. An advanced intermediate student group could play all of the notes of this movement without difficulty. Getting to the depth of the music will be another question altogether. For one, approaching the homogeneity of sound and articulation that one expects from versions of Palestrina’s choral music will be challenging. The effort, however, will be well worth the challenge. Agnus Dei I is just a little over two minutes long. The 1880’s edition of this movement is in F major and Brown chooses to transpose the movement up a minor third into A-flat major. The resulting first trumpet and trombone parts are both quite high, high b-flat and high c. Only advanced players will be able to negotiate those parts with the ease required to imitate the simple choral flow of the original composition. Credo is the most extensive of the settings at just over eight minutes in length. This movement contains both the imitative contrapuntal style we expect from Palestrina and chordal, homophonic moments that originally marked important textual transitions. The brass tessituras are quite reasonable--the trumpet parts stay within the staff. Each part has a great deal of melodic interest although the tuba player will have to endure a 33 measure rest. Missa O sacrum convivium, while not a well-known mass, nonetheless represents the surpassing beauty of Renaissance polyphony. Brown’s transcriptions can provide a lovely stylistic contrast to your recital program. They can also serve more solemn occasions—in preludes or postludes.